On the first day of the F8 developer conference, Facebook finally pulled the trigger on something we had expected for months. Facebook messenger is now a platform along the lines of WeChat and other Asian messaging apps. While this isn't necessarily "novel", it tells us something about Facebook's vision for mobile. In essence, Facebook seems to be implementing natural "links" between apps, i.e. user interactions flow from app to app, much like the desktop web. Facebook's vision seems to rely on their network of users and their social interactions to solve the app discovery problem. This presents an interesting contrast with Google's vision -- an algorithm to present the right information in the right context. It's no surprise that each company's vision is entirely built on their inherent strengths. But I'm actually starting to think that their contrasting approaches are much more complementary than they might appear. On a simplistic level, both Google and Facebook are direct competitors because they build mobile services and generate revenue from advertising (made more valuable because of data-driven targeting). While this is true when it comes to monetization, each company follows a very different approach to craft a value proposition for their users. Google follows an algorithmic and data-driven approach to organize and provide users with information (e.g. Google Maps, Search, Google Now). In contrast, Facebook's approach is less data driven and more reliant on enabling social interactions between users. Once you look at the two companies through this lens, it actually seems as though both visions are somewhat complementary. Gathering information is just as important as spreading it. Extending this argument to app discovery, social vs. contextual discovery may fit different kinds of apps. 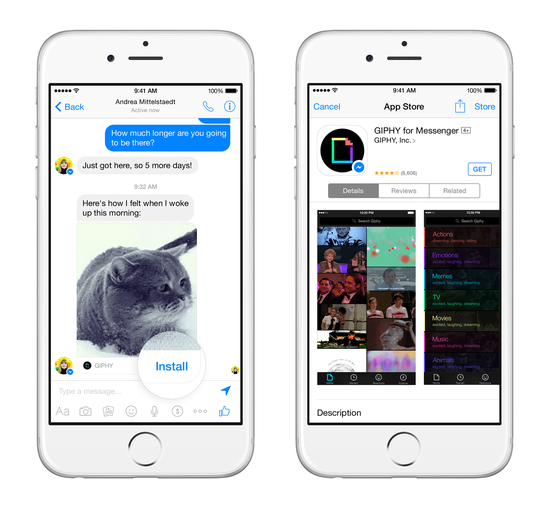 It's no surprise that most of Facebook Messenger's initial partners are publishers or content-based apps. Social discovery seems to fit these kinds of apps like a glove. On the other hand, apps that are more transactional in nature (on-demand transportation, or anything that involves mobile commerce) are likely to favor a more algorithmic approach (a user is more likely to use Uber/Lyft when he lands at an airport, irrespective of his/her social interactions).